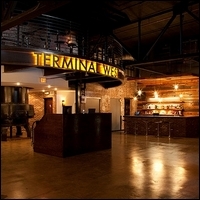 Terminal West is a 7,000-square-foot music and special events venue in historic West Midtown Atlanta at the King Plow Arts Center. It was originally a 100-year-old iron and steel foundry used to manufacture plows as a part of the King Plow Company. Featuring high end lighting and sound and an outdoor roof deck overlooking the historic train tracks of West Atlanta, Terminal West is the home of friendly staff, tasty cocktails and unforgettable nights of music.